Too popular at work? 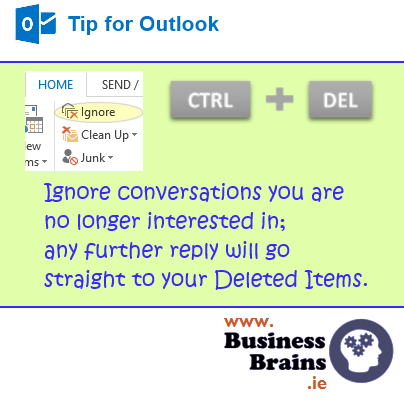 For some reason, your Outlook inbox is where everybody else’s conversations converge. From now on, instead of deleting messages that you are not interested in, why not delete messages which you will not be interested in? Yes. Delete the future before it happens. Change the course of – not your entire life – your work day and no longer receive messages you know you will not want to read. To mute or ignore entire conversations, select a message and press CTRL+DEL: any messages in the same conversation (i.e. with same subject line) will be moved to your Deleted Items before you ever see them in your Inbox. Or click Ignore. That reminds me of Marty in Back to the Future. Or Arnie Terminator travelling back to erase John Connor. They ended up in a lot of trouble so please use carefully. Try it! You click Share now and I’LL BE BACK.